They almost epitomize the whole series,' she says of the scripture Harry reads in Godric's Hollow. HOLLYWOOD — It deals extensively with souls — about keeping them whole and the evil required to split them in two. After one hero falls beyond the veil of life, his whispers are still heard. It starts with the premise that love can save you from death and ends with a proclamation that a sacrifice in the name of love can bring you back from it. Harry Potter is followed by house-elves and goblins — not disciples — but for the sharp-eyed reader, the biblical parallels are striking. Author J.K. Rowling's "Harry Potter" books have always, in fact, dealt explicitly with religious themes and questions, but until "Harry Potter and the Deathly Hallows," they had never quoted any specific religion. That was the plan from the start, Rowling told reporters during a press conference at the beginning of her Open Book Tour on Monday. It wasn't because she was afraid of inserting religion into a children's story. Rather, she was afraid that introducing religion (specifically Christianity) would give too much away to fans who might then see the parallels. "To me [the religious parallels have] always been obvious," she said. "But I never wanted to talk too openly about it because I thought it might show people who just wanted the story where we were going. But if she was worried about tipping her hand narratively in the earlier books, she clearly wasn't by the time Harry visits his parents' graves in Chapter 16 of "Deathly Hallows," titled "Godric's Hollow." On his parents' tombstone he reads the quote "The last enemy that shall be destroyed is death," while on another tombstone (that of Dumbledore's mother and sister) he reads, "Where your treasure is, there will your heart be also." While Rowling said that "Hogwarts is a multifaith school," these quotes, of course, are distinctly Christian. The second is a direct quote of Jesus from Matthew 6:19, the first from 1 Corinthians 15:26. As Hermione tells Harry shortly after he sees the graves, his parents' message means "living beyond death. Living after death." It is one of the central foundations of resurrection theology. As the one to bring together all three magical Deathly Hallows, Harry, in fact, becomes the "Master of Death" by novel's end, able to bring back the spirits of his parents, his godfather, Sirius Black and his old teacher Remus Lupin. It's a conclusion that ends Harry's three-book-long struggle over questions about the afterlife, which begins when Sirius falls through a veil connecting this world and the next at the end of "Order of the Phoenix." "Deathly Hallows" itself begins with two religiously themed epigraphs, one from "The Libation Bearers" by Aeschylus, which calls on the gods to "bless the children"; and one from William Penn's "More Fruits of Solitude," which speaks of death as but "crossing the world, as friends do the seas." No other book in the series begins with epigraphs — a curious fact, perhaps, but one that Rowling insists served as a guiding light. "I really enjoyed choosing those two quotations because one is pagan, of course, and one is from a Christian tradition," Rowling said of their inclusion. "I'd known it was going to be those two passages since 'Chamber' was published. I always knew [that] if I could use them at the beginning of book seven then I'd cued up the ending perfectly. If they were relevant, then I went where I needed to go. "They just say it all to me, they really do," she added. But while the book begins with a quote on the immortal soul — and though Harry finds peace with his own death at the end of his journey — it is the struggle itself which mirrors Rowling's own, the author said. "The truth is that, like Graham Greene, my faith is sometimes that my faith will return. It's something I struggle with a lot," she revealed. "On any given moment if you asked me [if] I believe in life after death, I think if you polled me regularly through the week, I think I would come down on the side of yes — that I do believe in life after death. [But] it's something that I wrestle with a lot. It preoccupies me a lot, and I think that's very obvious within the books." That, by the author's own acknowledgement, "Harry Potter" deals extensively with Christian themes may be somewhat ironic, considering that many Christian leaders have denounced the series for glamorizing witchcraft. When he was known simply as Cardinal Joseph Ratzinger, the Pope himself condemned the books, writing that their "subtle seductions, which act unnoticed ... deeply distort Christianity in the soul before it can grow properly." 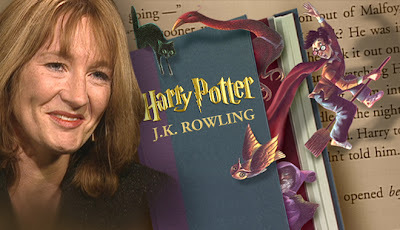 For her part, Rowling said she's proud to be on numerous banned-book lists. As for the protests of some believers? Well, she doesn't take them as gospel. "I go to church myself," she declared. "I don't take any responsibility for the lunatic fringes of my own religion." If you read the books, I hope you understand what she's talking about.I don't even really know where to begin with what I want to say. I'll suffice it to say that her last quote there resonated with me. (these are Jeff's words, not my own, but I agree whole-heartedly)! Perhaps I'll let it resonate, and say more later!